It was a day when Lawrence and myself had to make fun for ourselves at the club as Ian was off carousing with friends and family! Nothing deterred we decided to have a short day and do a bit more on our 1917 WofW campaign. The first game the system generated was quite a large one for just the two of us, we deployed 3 Sopwith Camels and a single Nieuport 17 against 3 Albatross DVs and a Fokker DR1. Apart from the 2 camels we were flying we let the solo system fly the rest. Both sides flew against each other head on and in a confused and twisting furball both Lawrence and me managed to bag a Hun Albatross, for the loss of our wingman in a Camel. The Boche breaking for home after 50% losses we returned to the airfield for lunch. Seeing we had plenty of time left we diced up a second game, this time our 2 camels and a randomly run Nieuport17 faced a pair of Rolands escorted by a single DR1. We tried breaking up the Rolands and picking on one but ended up getting shot from all sides. My plane took severe damage at this time from the Rolands rear gunners. The Nieuport tried to swing round the battle to our left but soon started sparring with the DR1, the manoeuvrability of both planes prevented much damage beyond a couple of long range hits each. At this point the Rolands as if on a signal broke to engage the Nieuport and hammering away with their forward guns soon sent it crashing to the ground. The Boche then turned to engage our camels who tried to avenge the loss of their comrade with sheer bravado. My already battered Camel took more damage and things were looking distinctly sticky until I managed to evade the pursuing DR1 and escape. Lawrence had tried valiantly to down a Roland but after his engine was hit, reducing his speed and manoeuvrability he to gladly took cover in the clouds. ..... A well handled 2-seater proved to be more than a match for a single scout. Ha! – just wait till the forthcoming SE5a models come out Red Baron – We’ll have you then! The Red army is pushing a German force back in late 1944. 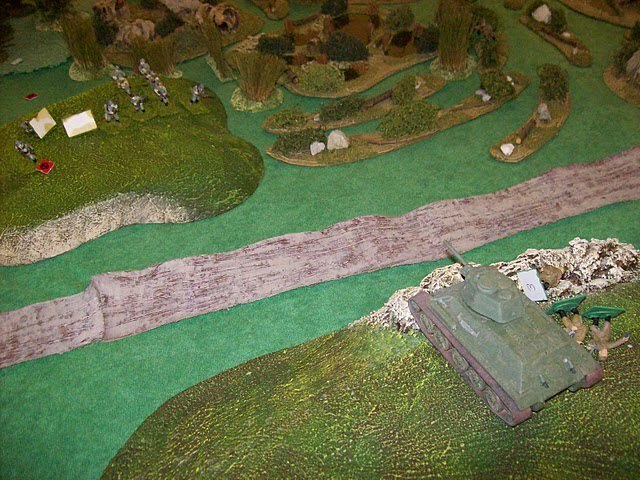 The German force has decided to try to stop the Russians in some difficult terrain. The Soviet force consists of a platoon of regular Soviet infantry and a platoon of 3 T-34s, one of which is armed with an 85mm gun. 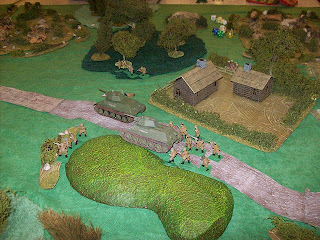 The Wehrmacht force is unknown to the Russians at the start of the game, and is run by the rules solo system. The Russians decided to put most of their force down the road they were following while a squad, supported by the T-34/85 were to move down the left wing. 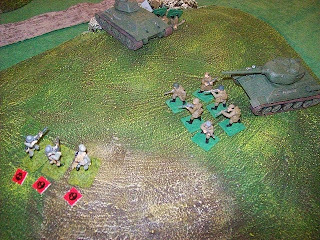 The terrain to the Russian right being too dense to allow the rapid advance needed to avoid the attention of the NKVD! The main Russian advance proceeded past a Dacha and immediately came under fire from a German squad in cover and a Pak 40 anti-tank gun on a rise further back. 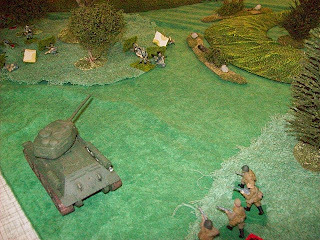 The front T-34 took a hit which blew the right track off, and the infantry riding ‘Desant’ on it jumped off leaving their dead NCO behind. The second Soviet T-34 dismounted its infantry and the combined force destroyed the German infantry quickly – largely due to a lucky 76.2mm HE hit. The Pak 40 managed to get another penetrating hit on the immobilised tank which stunned the crew, and then engaged the second tank which evaded the fire and managed to kill the gun crew with another lucky hit. On the left, the T-34/85 followed its infantry through the wooded terrain there and ran into a full squad of enemy infantry supported by a Panzerjager team with Panzerfausts. Once again the Russians prevailed thanks to their tank support, and the belated support of the command sections Maxim firing from a nearby rise. 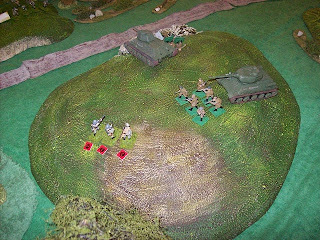 The Panzerjagers tried to get close enough to engage the tank but had to fire at too long a range and missed. 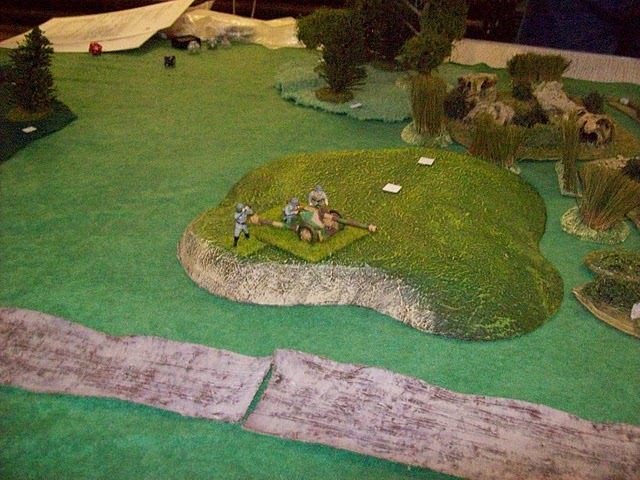 The Russian infantry took some losses though not enough to stop their advance. The Russians then converged on the main hill – the objective of the game, where they came under fire from another enemy squad on a nearby rise. This group was supported by 2 Panzerschreck teams. 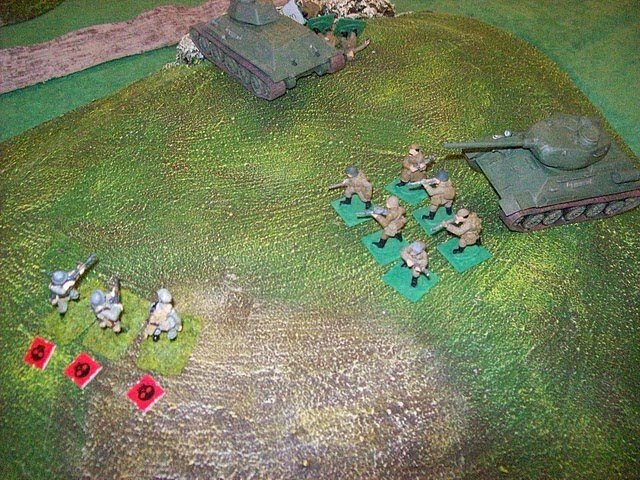 The Panzerschrecks blew both tracks off the T-34/85 and killed the gunner, and the supporting infantry was decimated, but the rest of the Russians managed to concentrate fire to scatter the Germans. 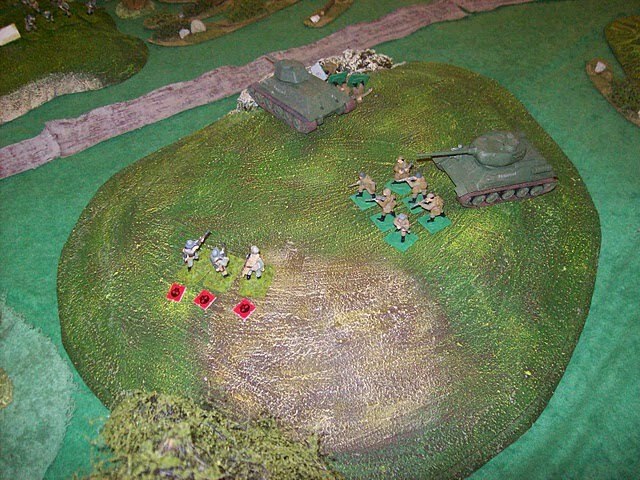 On the Russian right, the infantry attached to the first tank headed into the marshy area against orders and ran into a pair of German MG42s which killed several of them, the survivors evading and moving to help their comrades in their battle with the Panzerschrecks. At this point the Germans decided to fall back to conserve their forces. A Hetzer positioned at their rear had not been able to engage, but would be able to fight another day. Rule writing - my experiences! I started writing rules as a teenager back in the 1970s, which were invariably modifications of the then currently available commercial rules. I only started serious writing (if you can call this serious!) in the last 5 or so years. The first set I did was a Medieval skirmish set using a few elements from the 'Retinue' rules I had used many years before, and discarded due to the many rules abberations (EG to hit at long range, you have more chance by shooting somewhere else!). Much to my surprise, with very few corrections, the club players accepted them easily, and we still play them, albeit with some additions. The next set I did was for some lovely figures I got from Eureka miniatures and Ground Zero Games. These allowed us to do simple shoot em' up games in the Stargate SG1 universe. The solo system I devised was basic and rather random, but very much worked in the style of the TV programme battles. However, Ian Logan at the club suggested I develop a version for World War 2 , which has had add-ons in the several years we have played it, and we still enjoy it. The main development in this set was an improved solo system, which, with some development works reasonably well. The next development came from a crazy idea I had to try and simplify the whole gaming system - combining Movement, morale, shooting and observation in a single chart. This would allow players to run a single figure using parallel rules while all the other figures on the gaming table fought their own battle despite them. Needless to say, once my club friends, Ian and Lawrence started playing the system, we found that we were able to command units up to 70 strong! Its very different to conventional rules. I think Ian still cant get his head around the game concept! The whole idea was to throw a d6, and cross reference the result with a total of 'Risk Factors' - rather like morale testing in other sets of rules- and consult a chart to see what the group will do - advance, fall back to cover, stand and shoot etc. Over several games we found the chart was too overworked and I had to separate shooting from the chart into a more conventional system running in parallel with the Actions chart. 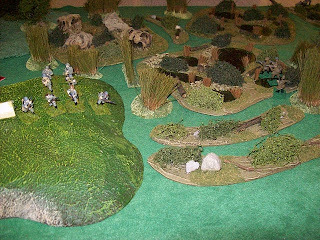 This system has been modified from the original 'French and Indian wars' skirmish game into several different periods. I enjoy it! I modified a Belgian Seven years war web set of rules, but this seems to have been just a massive series of modifications rather than a unique idea of my own. I have to admit there have been some real turkeys amongst my reasonable sets, but I guess that is to be expected. I suppose they were valid parts of the learning curve for my rule writing! 1) Go for it! - get something down on paper or Word doc. 2) Always write as simply as you can. Never try to write for every eventuality initialy. 3) When writing a rule, always try to imagine how the most awful rule lawyer would interpret it. (5) A force balancing system like an army list. Blogging is a new world to me! I have only just got home internet connected and am looking forward to inflicting my strange and subjective views on the world here! 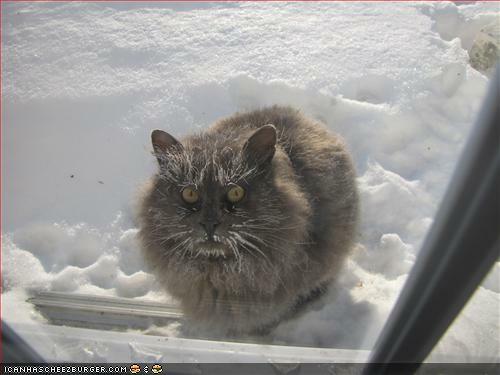 I am not sure what I will put here but I am sure something will appear!